Abstract: To meet the transportation demand and maintain sustainable development, many countries are aiming to promote and strengthen the competitive position of inland shipping in the transport system. Autonomy is seen as a possibility for maritime transport to meet today's and tomorrow's challenges. In realizing autonomous navigation, Path planning plays an important role. Being the most widely-used path planning algorithm, A* and its extensions are analyzed in the paper. 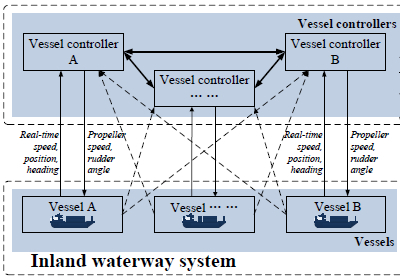 Since for vessels, the optimal paths generally have heading changes only at the corners of obstacles, a modified A* algorithm (A*BG) for autonomous inland vessels is proposed. Two locations where ship accidents frequently occurred are chosen for simulation experiments. Experiments are carried out to compare the performance of A*, A*PS, Theta* and A*BG. The influence of the size of neighborhood (the range of nodes that algorithms search in a single step) is also investigated. The path length and computation time of each algorithm is calculated and compared. Reference: L. Chen, R.R. Negenborn, G. Lodewijks. Path planning for autonomous inland vessels using A*BG. In Proceedings of the 7th International Conference on Computational Logistics (ICCL 2016), Lisbon, Portugal, pp. 65-79, September 2016.